Just a couple of questions. I am worried about bacon grease splatter. 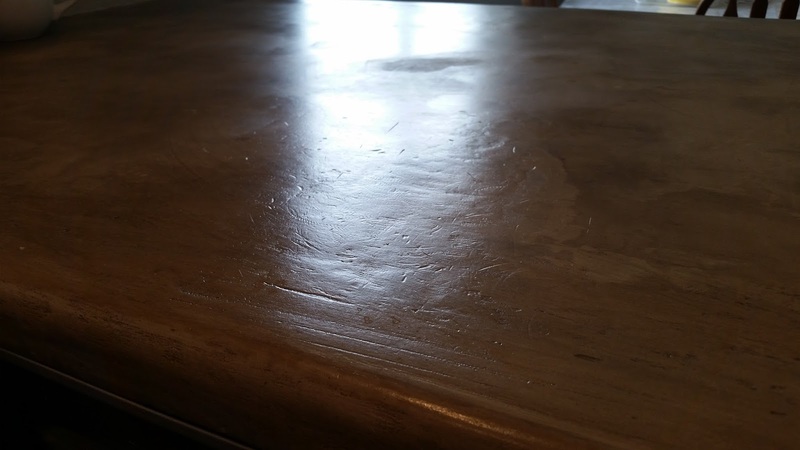 Is this going to stain my counter?Also, did you stain your counter? Your counter looks to be more of a brown than gray. 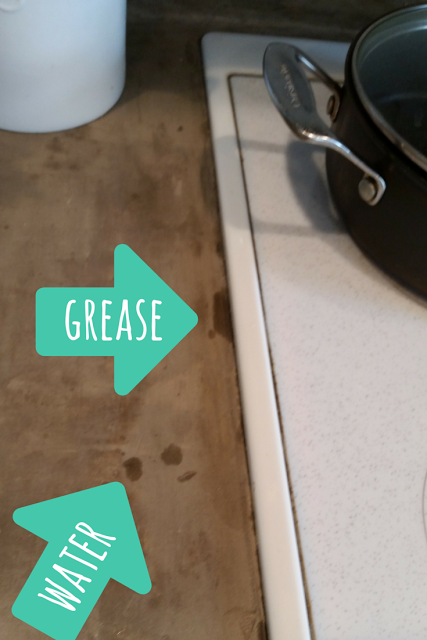 Depending on how you seal your counter (using an actual food-grade “countertop concrete sealant”), no, bacon grease should not stain it. I have even accidentally left grease splatter on the counter for a couple of days and it still didn’t stain through the sealant. 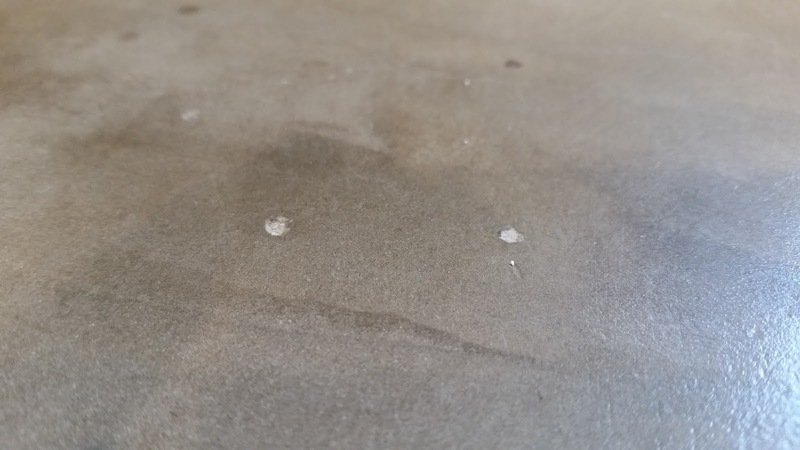 I only have grease stains seep into the concrete where my sealant didn’t quite seal the edges between my counter and stove. That was a “user application” problem, not a weakness in my chosen sealant. Hey! Love your counters. I’ve had the materials to do mine for about a year now and still have not gotten around to doing them. I have one question that I can’t seem to find an answer to no matter how many blog posts I read on this project. DO YOU HAVE TO REMOVE YOUR SINK?! This is my biggest hang up right now because I don’t want to deal with the plumbing necessary when removing the sink. Mine is a drop in stainless just like yours. Did you remove it when you applied the ardex? If not, how did the edges turn out? Thanks! Spark, I did not remove my sink. I don’t think you need to. Frankly, it sounds like a whole lot of work for countertops that are temporary. (Yes, temporary. These babies are not meant to last more than 1-3 years without a re-do). I taped it off with plastic covering the sink all around the edges. Get very very close to the edge. Like an exact fit. HOWEVER, I pulled the tape off after we did the concrete layers and forgot to tape off again when we did the sealant. I didn’t want to pull tape off at the end of the project and leave the concrete edge vulnerable to water seepage. I figured the sealant was runny and clear, so I’d just wipe off whatever sealant got on my sink and let the sealant barely touch the stainless steel to create a nice seal. This was a very bad idea. I didn’t wipe the sealant in time. Mostly because it’s so clear at first, and you don’t see the slight color change until it’s dry and won’t wipe off. I had to fix it with a flat razor blade and a whole lotta patience. But I’ve never once had a water leak into the concrete around the sink. Get a great seal. Don’t pull the edge of the seal off with your tape. But as for pulling out the sink, I’m not sure I’d recommend that either. Well, that was wordy. Woops. Now that it has been another year. How do you like them? Are they holding up just the same? I am getting ready to do mine and loved your updated post. Another question are your counter tops rounded? Mine are so was looking at yours and it looks like it but just not sure. Hi Tammy! Sorry for the delay. 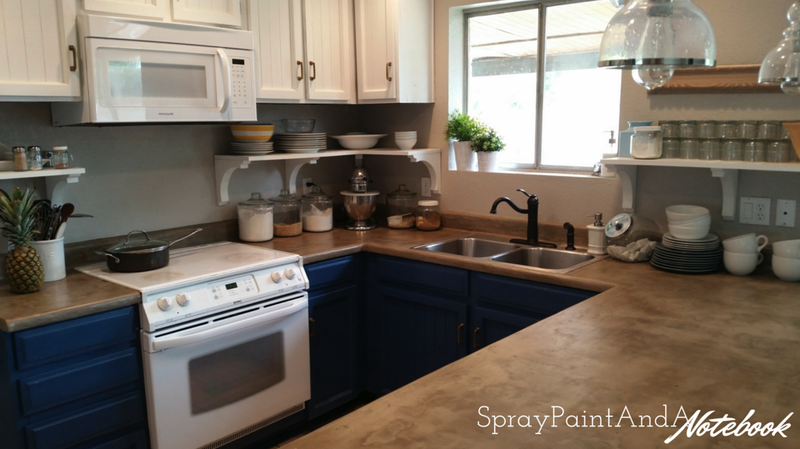 Yes, I still have those same concrete countertops, going on 3.5 years now. (I wrote up and photographed the 11 month post a long time before I actually posted it). I’m not going to lie, they’ve taken a beating. I’ve got a few more chips, some saw marks (you read that right), acrylic paint drips, and scratches. They are DEFINITELY ready for a re-do. I mean, they’re not so bad that it’s completely disgusting, and I’m not mortified when people come over, but they need a re-do. I’ll take some pictures this weekend and post an updated post sometime next week? As for your questions, only the countertop edges facing the food preparer are rounded. 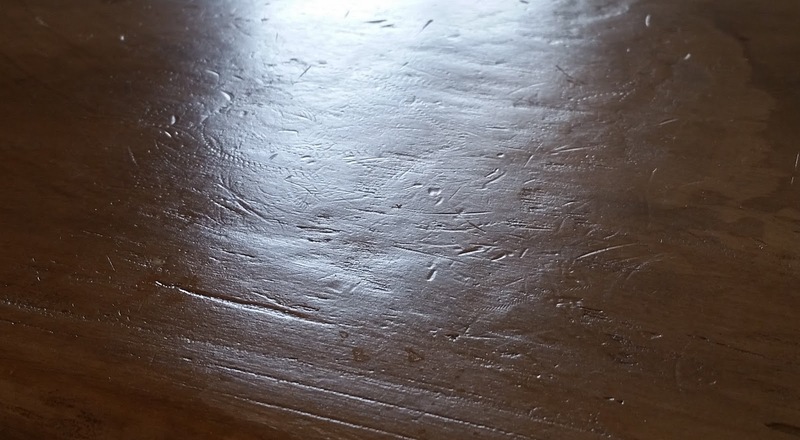 The edges on the sides and backside of the counter (where the stools go) are squared-off edges. So, I’ve got both! Thank you Tara! I am hoping to start mine soon. My concern was the rounded edges but when I saw yours made me feel better. The round edges are a bit tricky to paint over. I used a cheap foam brush to gently paint as evenly as I could. It works as well as to be expected. 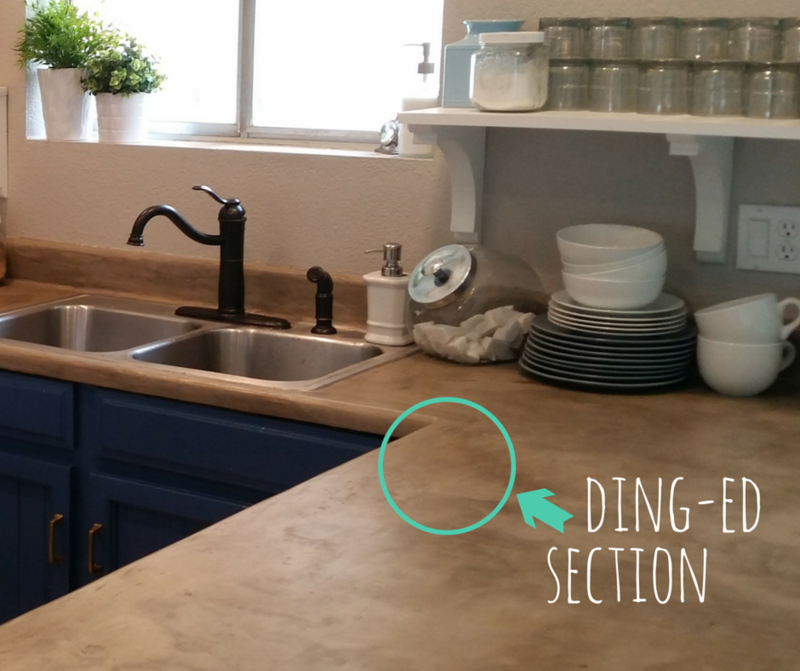 Also, I updated with a new post about those counters today! Check it out!